For the three day week-end the Belle and Bad Boy decided to do a staycation in the Triangle but The Traveler’s itchy feet got the best of her and she took some extra time off to head out on a road trip. Look for a post in the near future about all her adventures. Just because The Traveler was out of town there was no reason for Triangle Street Eats not to do a review. So Belle and Bad Boy decided to see where the food trucks were planning to serve Saturday and Sunday – preferably a food truck at a local brewery. We were in luck! Chai’s Global Street Food was scheduled to be at Raleigh Brewing Company Saturday. After arriving and ordering Moravian Rhapsody, a crisp, hoppy pilsner, we were told the food truck had broken down. Of dear, what to do? What else but order another round! 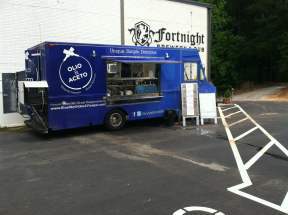 As another well-known Southern Bell said, “After all, tomorrow is another day.” Once again, we were in luck and Olio and Aceto was going to be serving brunch at Fortnight Brewery on Sunday. Although we usually think of food truck fare for either lunch or dinner, brunch was a novel idea. So, Sunday found Belle and Bad Boy headed out to have brunch with Olio and Aceto. Sunday, before leaving for Fortnight Brewery to sample the fare of Olio and Aceto, I was checking their menu on the web and couldn’t help but tweet about how good menu selections looked. I quickly received a response from them saying they would not be serving their standard menu, but a brunch menu instead. Thanks, Olio and Aceto for being so thoughtful – great customer service! On our way to Fortnight Brewery via Uber, Bad Boy and I decided we would have to order at least one item we knew The Travel would have ordered. As soon as we took a look at the brunch menu we knew biscuits and sausage gravy would be The Traveler’s choice (she orders this whenever available when the friends do breakfast) along with Mac and Cheese bites. A cheddar biscuit with honey mustard glazed ham and French Toast with raspberry cream cheese, lemon icing, raspberries and granola were my selections. The cheddar biscuit with honey mustard glazed ham was not your typical ham biscuit. The biscuit was tender with just the right about of cheese and the ham was moist. The honey mustard glazed added to the perfection of this selection. The biscuit and gravy was quite hardy and filling. The gravy was smooth with a velvety texture and loaded with tasty sausage. Next, I moved on to the Mac and Cheese bite. The bite was lightly breaded which let the flavor of the mac and cheese with just a hint of spicy come through. It was a bite of gooey goodness, yum. I think Bob would have liked the bite. Now for the pièce de résistance, the French Toast!! 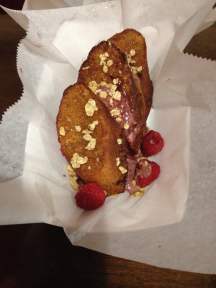 Olio and Aceto’s presentation of the French Toast was picture perfect, encouraging you to dig-in. The first bite of this raspberry cream cheese ladened piece of heaven made my eyes roll back. I definitely did not want to share the French Toast. It was delightful and I wanted it ALL. But, that’s not the way this works, so I grudgingly gave the Bad Boy a small piece to try. Now that I have sampled the brunch menu, I can’t wait to give the standard menu a try. Thank you. Olio and Aceto for a wonderful brunch, it was awesome, awesome. Can I say awesome one more time! Brunch, the word beckons the opportunity to sleep-in. No wonder it has become a tradition for Sunday morning when the following Monday is a holiday. 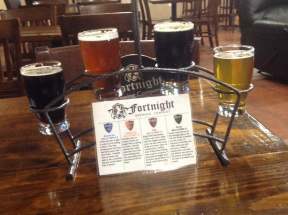 Since we had missed an opportunity to catch Chai’s Global Street Food at Raleigh Brewing Company the day before, we decided on Sunday to dine with Olio and Aceto at Fortnight Brewery, and sample a ‘flight’ of English-styled-brews as well. Upon arriving, we found the crowd thinner than on our previous visit. Likely a tribute to the holiday weekend, with so many people having planned to be elsewhere and who could blame them. After looking over the menu board, I had decided that I would try Biscuits & Gravy, in honor of the traveler, who was not able to join us. For a dollar more, I had added a poached egg. I had also decided to try a mac-n-cheese bite. 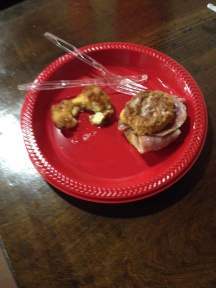 With the Southern Belle’s selections of a Cheddar Biscuit, with honey mustard glazed ham and French toast with raspberry cream cheese, lemon icing, fresh raspberries and granola, we had a broad enough sampling of Olio and Aceto’s fare. They brought it to us inside, where I was now working on my second of four samples from the ‘flight’. Eager to sample the cuisine, I started in on the biscuits & gravy. I was glad I had gotten the poached egg with it. It gave the course a good balance, with a thick full-bodied sausage gravy and a biscuit for balance, it was very special. If I had one critique, it was that the biscuit could have been a little more tender and flakey. The Cheddar Biscuit, with honey mustard glazed ham on the other hand was perfectly developed, even the biscuit! The flavorful honey mustard glazing complemented the ham wonderfully, as well as the third brew I was now starting on. I had a bite of the mac-n-cheese bite. I was pleased to note that it had just enough heat to appreciate the balance of mac-n-cheese, enveloped in light breading, deep-fried. As I fought back the urge to go outside and get another mac-n-cheese bite, I realized that we still had one dish left to sample, French toast! The French toast was made from a baguette, giving it a true French emphasis. Accompanied with a wonderful raspberry cream cheese and fresh raspberries, the dish was a delight. Who needs sticky syrup when you can have lemon icing instead anyway. To the hard working ladies of Olio and Aceto, you can make me breakfast anytime. I also look forward to sampling you usual fare, perhaps at the up-and-coming Raleigh Food Truck Rodeo next month. On a road trip. Sorry I missed brunch with my friends. Belle and Bad Boy get ready for another food truck adventure when I return. I can’t wait to do another review with you! Right now, I’m writing my travel log for this trip that I will be sharing with everyone later.